LONDON - Oct. 5, 2016 - PRLog -- Mobile tower operators are assessing a range of new merger and acquisition opportunities globally, as their portfolios expand and telecom operators continue to offload infrastructure, according to leading TMT M&A bankers and advisers meeting at TMT Finance World Congress 2016. "Telecom tower sales have been increasing for several years and the current wave of deal activity has reached a new level as regional towercos look to consolidate," commented one telecom banker. "A number of global telecom operators including Deutsche Telekom, STC, Zain, Etisalat, Telefonica, Telecom Italia, Turkcell and VimpelCom are currently preparing billions of dollars of infrastructure asset sales. Meanwhile, competition among buyers is strong. European, Asian and African towercos are looking to build scale, and well-capped US towercos including ATC, Digital Bridge and SBA are monitoring global expansion opportunities. Private equity firms and infrastructure investors have also been screening various assets." TMT Finance, which specialises in exclusive news and events for senior executives in telecoms, media and tech, is currently reporting live towers sale processes in France, UK, Germany, Turkey, Russia, Bangladesh, India, Myanmar, Saudi Arabia, Ghana and Kuwait, among others. Tower or infrastructure-based IPOs are also being tipped to drive deal activity in the sector with China Tower Corporation, Deutsche Telekom, Turkcell, Arqiva, IHS Towers and Edotco all tipped to be considering flotations in the near to medium term. 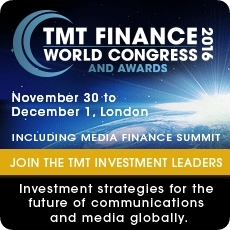 The key global towercos are meeting with telecom leaders, investment bankers and advisers in London at TMT Finance World Congress 2016 (http://www.tmtfinance.com/world/) on November 30 to assess the latest opportunities for international co-operation. Confirmed towerco speakers include representatives from Cellnex, INWIT, Digital Bridge, IHS Towers and Eaton Towers, alongside the most active investment banks, investors and advisers. Over 100 speakers and 350 delegates are expected at this year's event which has been expanded to two days to meet the demand for cross sector investment and consolidation in telecom, media and tech industry globally. Key session themes include: European and World Telecom Leadership Strategies; TMT Mergers and Acquisitions, Towerco Investment, Digital World, Enterprise Cloud and investing in Media. Awards for Telecom Infrastructure Deal of the Year, as well as Telecom, Media and Tech Deals, TMT M&A Adviser and Global Growth and TMT Leadership will be presented at the annual Awards Dinner following the first day of the Congress. C-level executives announced as speakers so far include representatives from: VimpelCom, Iliad, Altice, Axiata, Etisalat, Vodafone, Telia, Tele2, Safaricom, Channel 4, RTL Group, KPN, PTCL, EE, Six Degrees, KKR, BNP Paribas, Societe Generale, Next Generation Data, O3B Networks, IXcellerate Moscow Datacentre, CityFibre, IFC, ABRY Partners, Accenture Consulting, EY, Enet, Goldman Sachs, Nomura, UBS, Citi, ING, IFC and the World Bank, and many more.